Part of the "Summer Particles 2015" collection, the sultry "Silence Between Us" from Li-Polymer was a poignant reminder of the Portuguese artist's skill and talent. Now receiving its own release, remixes courtesy of exceptional Israeli and Swedish talent prevails. Comprising the combined talents of Alan Sharpear and Mattias Lindblom, the Israeli/Swedish production meld saw the inception of the Sapiens and Springa outfit. Both formidable talents in their own rights, Sapiens has seen his classical piano training bear rich dividends as an ear for music developed into regular DJ slots across Tel Aviv with his music signed to Suffused Music, Baroque and Stellar Fountain. Springa's alter-ego, as part of the hugely successful and highly influential Inkfish outfit, needs little in way of introduction with over two decades involved in the music industry and innumerable successes. Under his new pseudonym, impressive original work for Low Pressings, Mistique Music and System Recordings has seen a rewarding 2015 for the Swedish maestro. Joining forces for October 2015's "The Version", Sapiens and Springa lit up the autumn twilight with a quartet of tracks that showcased their considerable combined skills in no uncertain terms. Now returning to the label, their reworking of "Silence Between Us" showcases a smooth melodic flow that encompasses characteristics of Li-Polymer's original. Sapiens' keyboard skills resonate throughout as a lazy percussive cadence sits atop a melange of haunting vocal cuts and sumptuous pads. Additional production to the fore, the Sapiens and Springa remix is an impressive affair. A man in possession of prodigious talent and sublime production skills, Israeli maestro, Matan Caspi, describes 2010-2012 as his "breakthrough years". An integral tastemaker and playmaker in the EDM scene, he has performed in over twenty countries finding his maturing, ever-evolving productions allied to a host of high-profile imprints including Pacha, Spinnin' and Black Hole. Furthermore, the formation of 2011's Outta Limits with Stan Kolev saw the pair with a label that rapidly hit the charts of digital stores on numerous occasions and in multiple genres. Regularly supported by Tiesto, Ferry Corsten and Above and Beyond, Caspi's sound has been a staple of the sets of the DJ elite across the globe. 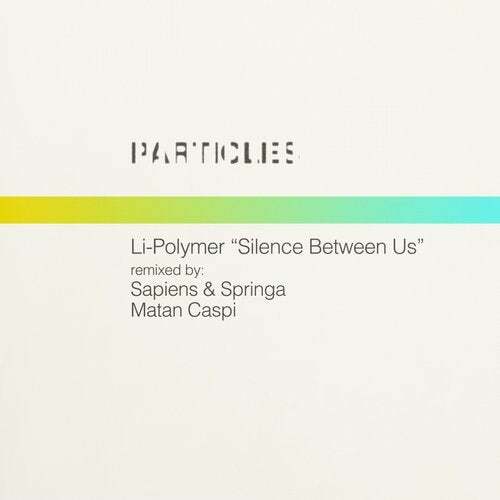 Making a very welcome debut on Particles, the Matan Caspi remix of "Silence Between Us" provides a hallmark of instant quality as pounding beat and delicious house-based percussion sit locked against a smooth bouncing bass line that pays tribute to Li-Polymer's original. Evolving elegantly over its seven-and-a-half minutes, a deep groove blossoms with the aid of sparkling melodic lines, textured pads and pulsating strings. The result is a clever and intelligent reworking that amply illustrate Caspi's talents. The "Silence Between Us" erupts into fizzing energy with two new remixes of Li-Polymer from Sapiens and Springa and Matan Caspi.